In 2019 scientists funded by Bill Gates will begin a massive geoengineering project aimed at dimming our sun. Harvard scientists will attempt to replicate the climate-cooling effect of volcanic eruptions with a world-first solar geoengineering experiment. Thefreethoughtproject.com reports: Known as the Stratospheric Controlled Perturbation Experiment (SCoPEx), the experiment will spray calcium carbonate particles high above the earth to mimic the effects of volcanic ash blocking out the sun to produce a cooling effect. Naturally, the experiment is concerning to many people, including environmental groups, who, according to Nature, who say such efforts are a dangerous distraction from addressing the only permanent solution to climate change: reducing greenhouse-gas emissions. The idea of injecting particles into the atmosphere to cool the earth also seems outright futile considering what scientists are trying to mimic—volcanic eruptions. If we look at the second largest eruption of the 20th century, Mount Pinatubo, which erupted in the Philippines in 1991, it injected 20 million tons of sulfur dioxide aerosols into the stratosphere. Scientists from the USGS estimated that this 20 million tons only lowered the temperature of the planet by about 1°F (0.5°C) and this only lasted a year because the particles eventually fell to back to Earth. When he saw Keith talk about the SCoPEx idea at a conference after starting at Harvard in 2015, he says his initial reaction was that the idea was “totally insane”. Then he decided it was time to engage. “I asked myself, an atmospheric chemist, what can I do?” He joined forces with Keith and Anderson, and has since taken the lead on the experimental work. Adding to the questionable nature of this experiment is the fact that it is largely funded by none other than Microsoft co-founder, Bill Gates. Gates is no stranger to controversial experiments as he’s publicly funded many of them including one that would implant devices into babies to automatically give them vaccines. While the Harvard team’s experiment may sound like something out of a dystopian science fiction movie, the reality is that it has long been on the table of governments and think tanks from around the world. In fact, just last month, a new study published in Environmental Research Letters, talked about doing the exact same thing—geoengineering and planes spraying particulates into the atmosphere to curb global warming. What’s more, that study echoed the sentiments of then-CIA director John Brennan when he addressed the Council on Foreign Relations in 2016, detailing a similar process of spraying chemical particulates in the atmosphere to cool the planet. At the meeting, Brennan addressed instability and transnational threats to global security at a meeting with the Council on Foreign Relations. During his long-winded talk of threats to US interests and how the largely CIA-created ISIL threat is impacting the world, Brennan brought up the topic of geoengineering. Brennan went on to echo the calls from some scientists who have called for aerial spraying. The extent at which Brennan talked about stratospheric aerosol injection shows that he and the CIA have likely been considering this for some time. Although we are hearing more and more talk about geoengineering, it has been around for a very long time and not just in the realm of conspiracy theories. In fact, scientists have already suggested that it could be going on right now, unintentionally. 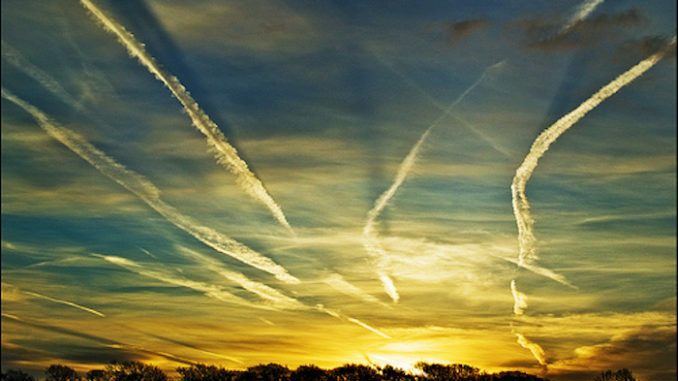 Researchers with the National Oceanic and Atmospheric Administration (NOAA) are suggesting contrails from airplanes may be inadvertently geoengineering the skies. Chuck Long is a researcher with the Cooperative Institute for Research in Environmental Sciences (CIRES) at the NOAA Earth System Research Laboratory at the University of Colorado in Boulder. At the American Geophysical Union Fall Meeting, Long and his team released their paper, “Evidence of Clear-Sky Daylight Whitening: Are we already conducting geoengineering?” The analysis found that vapor from airplanes may be altering the climate through accidental geoengineering. To be clear, no one here is claiming to be an expert on climate change or the effects of geoengineering. But one thing is clear and it’s the fact that there is still much to be debated and learned before humans deliberately begin altering Earth’s climate. Aside from doing nothing to curb carbon emissions, if we are so quick to jump on this method, it could set off a chain reaction that could prove to be catastrophic. I will sue for wrongful endangered to the welfare of children.